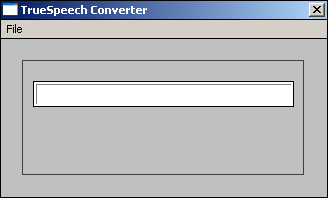 The TrueSpeech voice compression technology has been developed by the DSP Group of Santa Clara, California, a company specialized in DSP applications. It is available in several versions and bitrates. By far, the most popular version is 8.5 (8.5kbps), which is bundled with older versions of Windows from Windows 95 to Windows XP as an ACM codec. The encoder featured here encodes to this version. At the bottom of the page, you can also find an installer that adds the codec to Windows Vista and newer versions. The TrueSpeech web site can be visited at the Internet Archive, here.